Somaliland continues to march forward, aiming at independence and reclaiming its sovereignty from Somalia, after more than two decades. Somaliland, a self-declared republic inside Somalia, celebrated 22 years of "independence" last month. Somalia has recently again called for unity, but Somaliland's leader says his region is doing better than other parts of Somalia. Sitting on the Gulf of Aden, Somaliland is officially regarded as an autonomous region of Somalia. The two were, however, separate until 1960. During a civil war in the 1980s, 40,000 people from Somaliland were killed, and nearly half a million fled. Somaliland, which is more tribally homogeneous than the rest of Somalia, has been striving for international recognition since it broke away in 1991. Al Jazeera's Nazanine Moshiri spoke with Ahmed Mahamoud Silanyo, Somaliland's president, about the challenges the area faces. 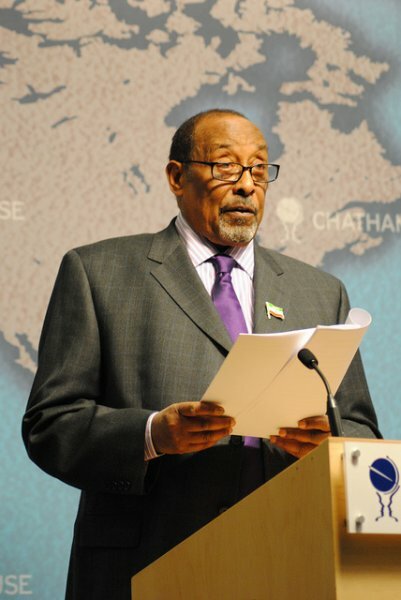 Nazanine Moshiri: President Silanyo, it has been 22 years since Somaliland declared independence, but you still haven’t managed to gain the recognition of the world. Are you any closer 22 years on? Ahmed Mahamoud Silanyo: Well, we may not have been recognised, that’s true. We realise recognition is not an easy thing - but the international community engages with us and works with us. It doesn’t mean we are cut off from the international community. On the contrary, we are very well-connected with the international community: they work with us, engage with us. I have just been travelling almost throughout the world, and meeting with governments. Governments and delegations come to us, they have aid programmes here, they support the democratisation programs here, and we deal and co-operate with the world. NM: You refused to go to the recent conference on Somalia in London. Can you tell us why? AS: I would like to say that we have very good historical relations with Britain. And much as we would have liked, it did not become possible for us to go because the London conference was held and chaired for Somalia. The prime minister and the president of Somalia chaired it. After consultations with different parties and different groups, we decided that it was not acceptable to us. We attended many meetings before, where talks were being held for Somalia and Somaliland, but this one was different. NM: A lot of money was pledged at that conference to Somalia. Do you think some of that money should go to Somaliland too? AS: Well, I think the international community has been helping us - we receive a lot of assistance from Europe. Of course we would like to see a commitment as far as development is concerned. NM: On your recent trip to the US, did they promise you they would recognise your statehood? AS: No, they did not tell us they would accept [or] recognise our statehood. They said they would continue their support and development programmes, that they would continue that commitment. NM: What do you think is behind this? The African Union is very clear on this. Do you think that if they give you and your country independence, then many other unstable regions would just flare up? AS: Whatever the reasons maybe, Somaliland and Somalia historically have been two different countries - you know the history of Africa and many other parts of the world. They emerged from the colonial period. As a matter of fact, at the time of independence many countries offered their recognition to Somaliland. But at that time, there was so much enthusiasm to unify all Somali-speaking people in the Horn of Africa, including Somalis in Ethiopia, Somalis in Kenya and Somalis in Djibouti. Unity was the ambition of young people but that was not possible, because of the policies of the powers of the world. Eventually the principle was accepted that Somalis in Ethiopia should live as part of Ethiopia. The people of Djibouti have established their own state: it used to be called French Somaliland, and has become independent and accepted by the international community. Those parts which were part of Kenya have remained part of Kenya. So why shouldn't Somaliland, a former protectorate, also be accepted by the international community? After the union with Somalia during Siad Barre’s regime, the type of treatment that has happened to Somaliland [was terrible]. You see the planes now in the middle of town - those were the kinds of planes that were taking of from the airport of Hargeisa and bombarding the population, including women and children, when they went out of Hargeisa to the Ethiopian border. These crimes were committed by the regime and Somaliland has ever since been struggling to become independent. NM: You have talks going on with Somalia brokered by the Turks in Istanbul. Can you tell us how those talks are going? AS: We held talks in Istanbul before, and the talks in Turkey are part of programme by the international community to establish reconciliation between Somalia and Somaliland. We are not against the talks; we accept them as long as they are on equal terms, and we were equally happy about the results. NM: What did you agree on? AS: We agreed to agree to more talks, and to respect each other and continue to co-operate in other ways. NM: But the president of Somalia has been clear: he says he wants to unite Somalia. AS: Well, I think I have been very clear too that we are going to return our independence. We would like to remain friends and co-operate. It is not I who decides, nor my government, but the history of Somaliland decided it will continue to be and has always been a different country.